The Wellington-Waterloo Hunt Club Inc (W-WH) is a group of riding enthusiasts dedicated to Nature, Foxhounds and Riding – together in camaraderie and sport. The well-being of land, hounds, horses and people are paramount with the goal of enjoying these things responsibly. We believe that being outdoors – watching as man and woman and horse and hound find fresh air, breathing room, and land to stretch – is a joy. The Wellington-Waterloo is incorporated as a not-for-profit organization, subject to all applicable rules and regulations. W-WH is one of many Canadian hunt clubs that belong to a larger organization – the Canadian Foxhound Club, which in turn is a member of the North American governing body for our Sport, the Masters of Foxhounds Association of America. 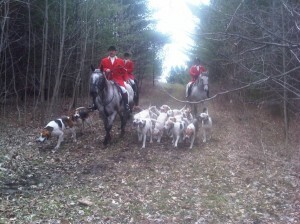 For more than 50 years, W-WH has been recognized and has hunted hounds in and around Wellington and Waterloo Counties on Wednesdays and Sundays. We have 2 seasons; spring season starts in mid-April until the last Sunday in May and the fall season starts in mid to late August continuing until the end of November. We model ourselves after the old English-style sport of Riding to Hounds – Without the live hunting! Wellington-Waterloo Hunt is a Drag hunt. Foxhounds search for and chase a unique scent that is dragged along a pre-determined path or field. Our hounds are happy, biddable and obedient. They are always friendly to people and the other dogs that they encounter along the way to the “Chase”. Instead of chasing an actual fox, a scented cloth is “dragged” (known as laying a drag) in advance of the hounds being cast to “hunt”. The Huntsman guides the pack by voice and with encouraging notes from the horn, until they “hit the line” and go off on a great “chase”. The Huntsman’s horn calls are also used to alert the following riders (the Field), foot/car followers and Whippers-in (who assist the Huntsman) as to what is happening. Foxhounds are born to run as a pack, noses to the ground, voices singing in full cry honouring the scent. The louder the “Music”, the stronger the scent. It’s a sound that one can find thrilling. And fear not, it is only joy, not thirst that gives the hounds – and horses – such excitement! Following the Huntsman and the hounds is the “Field”. These horseback riders are guided by a Field Master – an experienced horse person and rider to hounds, familiar with the territory and in communication with the huntsman, ground crew and whippers-in. At the end of the drag, hounds are praised, given a treat-based food reward, packed up and moved on. They are strongly discouraged to follow any scent but the one that we mix specifically for our pack. Hounds are chosen to “hunt” and be a permanent part of the pack based on that requirement. We respect other’s use of shared land and welcome questions on our club and our sport. Some people have the image of Foxhunting as a bunch of horses galloping over fields at breakneck speed and flying over intimidating jumps. The Field does enjoy some great runs, but the Field Master is there to make sure that any unsafe ground is avoided as far as possible. As for the jumping: There is always a way around so that those who don’t wish to take a jump don’t have to! For newcomers to the sport, a second, slower “Hilltopping” field is provided with its own Field Master. This is a non-jumping group and is ideal for horses who have not hunted before as well as new riders. Anyone who enjoys riding, likes to see new places and meet new people with the common interest of good times from the back of a horse, is invited to come out and see what Wellington-Waterloo Hunt is all about. For more information please click here to contact us .